Do you ever feel cravings for childhood foods, made just the way your mom or your granny used to? The summer heat wave suddenly made me crave one of my favorite childhood desserts, one I hadn’t eaten for almost a decade and certainly had never cooked myself: debesmanna. Translated literally, the name of this simple and mouthwatering dish is “heaven farina”. In contrast, the usual English translation is much less poetic: mousse. Debesmanna is a staple of the Latvian kitchen and THE childhood dessert for most Latvians. It is sweet and tart, and incredibly easy to make. And, not counting the milk that it is commonly served with, you only need three ingredients: farina, sugar, and berries of your choice. The most classical type of debesmanna is made with cranberries. But, as we’re still in strawberry season here in Germany, let me present to you a slightly different version, inspired by and adapted from Sandra Kalniete‘s cookbook – memoir “Prjaņiks. Debesmannā. Tiramisu”. Clean, wash and puree the strawberries. Pour the puree and water in a medium sized pot and bring to boil. 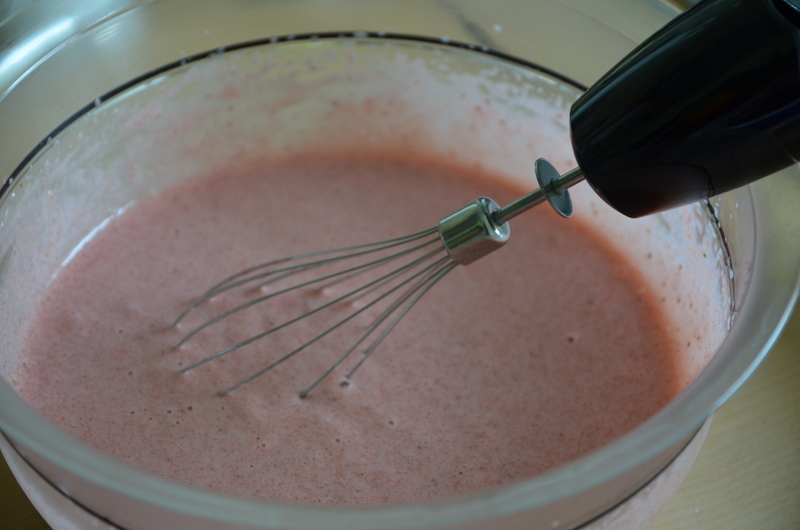 Add sugar, then slowly and gradually whisk in farina, making sure that it doesn’t form lumps. Boil for around a minute, then add lemon juice, and remove from heat. Once slightly cooled down but still warm, transfer to a mixing bowl and process for at least five minutes. Cover and place in the fridge to cool and thicken. Serve in bowls covered with some milk. This wonderful dessert can be made with almost any berries (fresh and frozen) or their juices: blackcurrants, redcurrants, bilberries, cherries, raspberries, plums, the list goes on. For the more classical cranberry debesmanna recipe check out the Saveur magazine. If you wish a sweeter taste, replace milk with vanilla sauce. It was my first time and I have to say that it was super easy. Puišiem noteikti patiks, mēs trijatā gandrīz pieveicām visu bļodu! I was trying to figure out how to print it or email to mail but don’t see any options . My Latvian mom Arija made it all the time. I love it. I’m very sorry you couldn’t find the option, Ingrid! There should be buttons for email and print in the row of sharing options at the bottom of the post. Thank you for the recipe. Debesmanna, like many Latvian foods, comes from Baltic German influence. You can see similar recipes in Estonia, where the peasants also emulated Baltic German nobility. It turns out that like other cuisines, Latvian cuisine is quite transnational. I did a little research before posting and the German version of the recipe is even called the same: Himmelspeise. It’s been largely forgotten here in Germany though. Yes, it is very interesting that the long German colonial history in Eastern Europe is not remembered well in Germany (at least that has been my experience). I am Latvian with a German last name because my ancestors took (or were given? no one knows) the name associated with their manor when the serfs were emancipated. They never Latvianized their last name, like other Latvians did. Germans are surprised when they hear this. Not to mention, the countless words in Latvian that come from German, including I believe, kūka. My experience is the same though, generally the Germans know very little about their involvement in Baltic history. Unless their families have come from the region (as most had to leave in the 30s). I remember meeting a lady at a tea shop whose parents are Baltic German, we had a fascinating conversation.